SUV (Sport Utility Vehicle) is a type of car that had the look tough, strong, and sporty. SUV in Indonesia was developed with strong character so as to adjust to the terrain and extreme weather in tropical Indonesia. Toyota launches SUV, with names Toyota Fortuner. 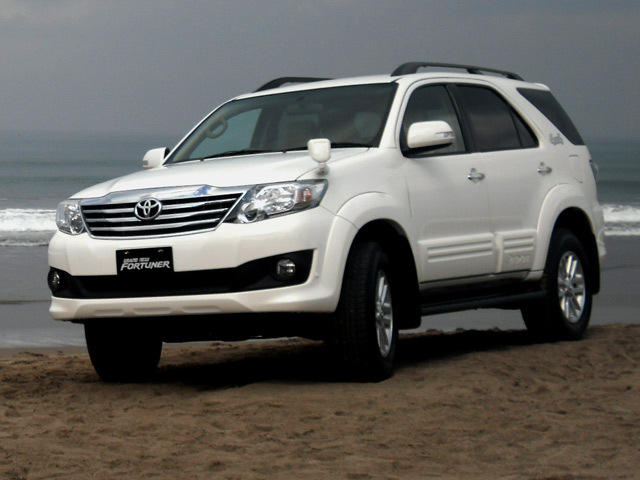 Toyota Fortuner developed as one project Innovative International Multi-purpose Vehicle (IMV) in the year 2011. Toyota Fortuner comes with a grade 4×2 High (Fortuner 2.5 G and 2.7 G Lux) and 4×4 Medium High (Fortuner 2.7 V). Market share of car sales in grade 4×2 and 4×4 in Indonesia continues to increase every year. Toyota Fortuner launch to arm in the face of competition in the SUV segment. Engine technologies that support the Fortuner toughness performance with a combination of technology and EFI VVT-i petrol engine resulting in excellent acceleration and fuel economy. Fortuner engine with VVT-i technology provides a optimal advantage of producing power, fuel efficient, and environmentally friendly. Fortuner on cabin space equipped silencer material and a layer of asphalt that is placed on the body Fortuner to silence the cabin so the driver feel comfortable in the cabin Fortuner. Toughness of the car as an SUV Fortuner is proven by the test drive event to explore the territory of Indonesia and International. Fortuner explore eastern Indonesia, namely Bali, Lombok, Sumbawa and Sumba International while exploring Asia to Europe. Fortuner SUV as the car has been equipped with Global Positioning System (GPS) for type V, TRD & GLux GLux, a tool that can distribute information through the head unit Audio-Video 6-inch Touch Screen. This feature makes superior compared to other SUV cars. Fortuner comes with a masculine exterior design and aerodynamics, the luxury features and interior panels, as well as safety and ride comfort due to the support of the performance of the engine is fuel efficient and environmentally friendly. A Fortuner SUV positioned as a "Toyota's Sophisticated Urban SUV to Express Your Lifestyle".